Virtual Education Partnership (VEd) provides software to primary and secondary schools, City Learning Centres, City Technology Colleges, Language Colleges and higher education establishments. The idea is to create virtual knowledge spaces in 360 degree environments. 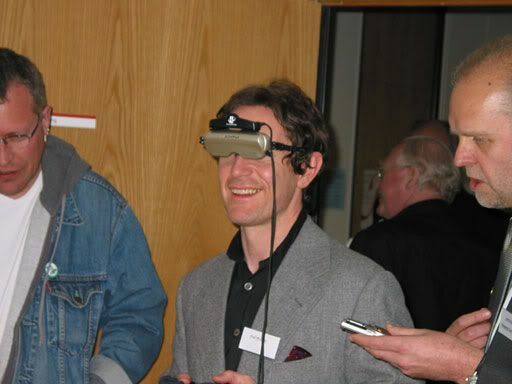 Here are a couple of pictures of Paul doing the virtual reality thing. 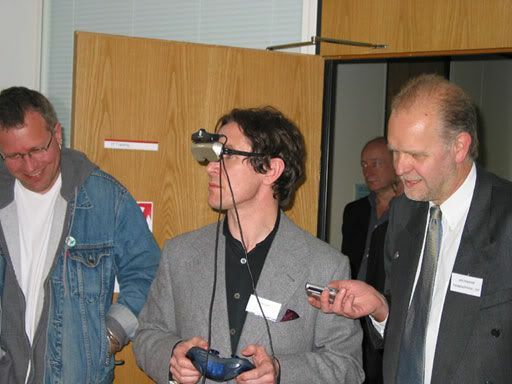 In this first one he explores his Liverpool roots in virtual galleries made for the Streets Ahead project, in the company of Robb Johnson (left) and John Hopwood (right). And in this second one, he interacts with the art and music work made by students of St. Julie's High School in Woolton, a few miles from where he was born in Liverpool. The site is at http://www.vr-education.com/news/veterans.htm. You know everytime I see these pics, I wonder--was he walking around, wearing that? Because it looks like he is, and how is he not bumping into everything around him? Why was he involved in this, btw? I haven't seen these pics before. Funny! I want to try out virtual reality, just to see what it's like! Lucky students. * Paul McGann (the Monocled Mutineer and a former Doctor Who) excitedly collecting the veterans autographs!